The last week has seen the team from Aspley Guise pack up and move to Bromham. That’s a distance of about 30 kilometres but the move involved serious logistics and planning as well as a decent dollop of muscle over the weekend just past. Adding interest to the move was the impending “big freeze” that was due to hit the UK on Saturday. Thankfully it held off until the move was finished – just. The lads were enjoying a couple of beers just as the first snow started to drift down. 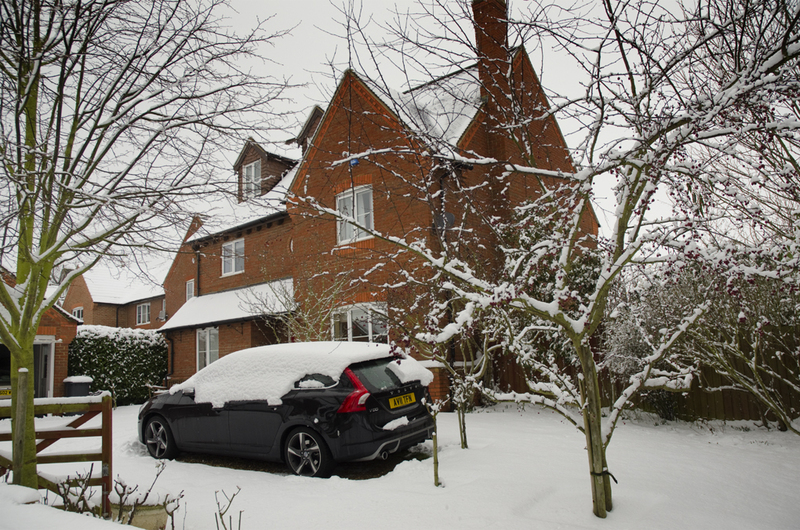 Next morning our new neighbourhood was under 3 inches of snow – what a lovely welcome to Bromham. This morning Jean was doing her hair in our bedroom when she let out a loud cry. Those of you who know Jean know that “doing her hair” is no simple exercise and a cry in the middle can signal a dreaded bad hair day. I rushed into the room expecting the worse to find her pointing out the window at a small deer grazing peacefully in the garden. I grabbed my camera but, as is often the case, only captured the deer about to leave the garden and head for the neighbours. Apparently the deer is a Muntjac, a breed imported into the UK in the early part of last century and originally domiciled at the Woburn Estate deer park (just up the road from our place). But as with the best laid plans, the deer escaped into the wild and since then have spread throughout lower England – including our back yard.